Add a Fun Casino Night to your Party to make your special day go off with a bang! Whether it be a Sweet 16th or 80th, you will have the most memorable birthday with a Fun Casino Night. Perfect for any celebration; Anniversaries, Christenings, Balls, Retirements, Club Presentation Nights, Prom Nights, and even Home Parties, we always provide a fantastic nights entertainment. No party encourages guests to socialise like they do around Casino tables! Don't want to hire a venue or event hall and instead host your party in your own home? Perfect, we can set up our portable tables in any room that has the space - and we don't mind moving pieces of furniture to make room. For home parties no matter how small, from as small as dinner parties with 6 guests, to special Birthday celebrations where you invite 50+ people round to celebrate. 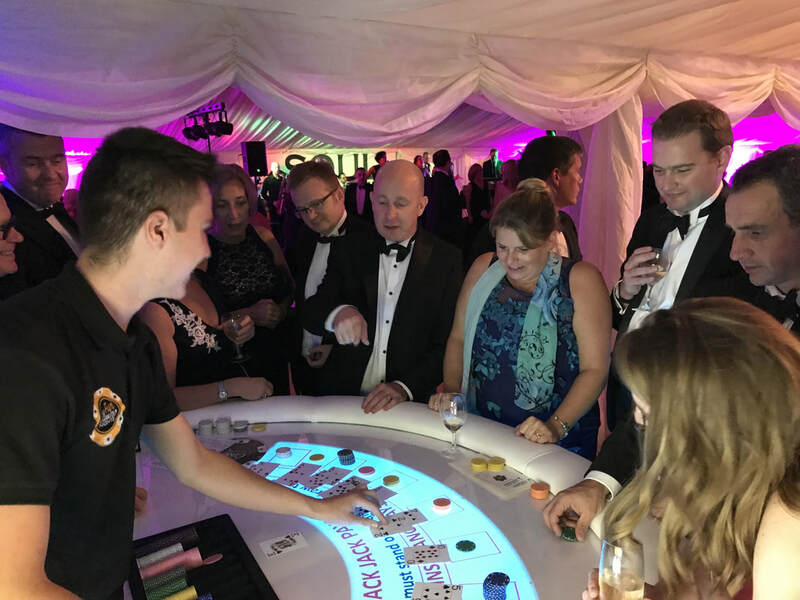 Choose our white Casino tables and with our powerful LED wash uplighting illuminating the playings surfaces and emanating from the casino tables, you can choose any colour to match your colour scheme of your event. 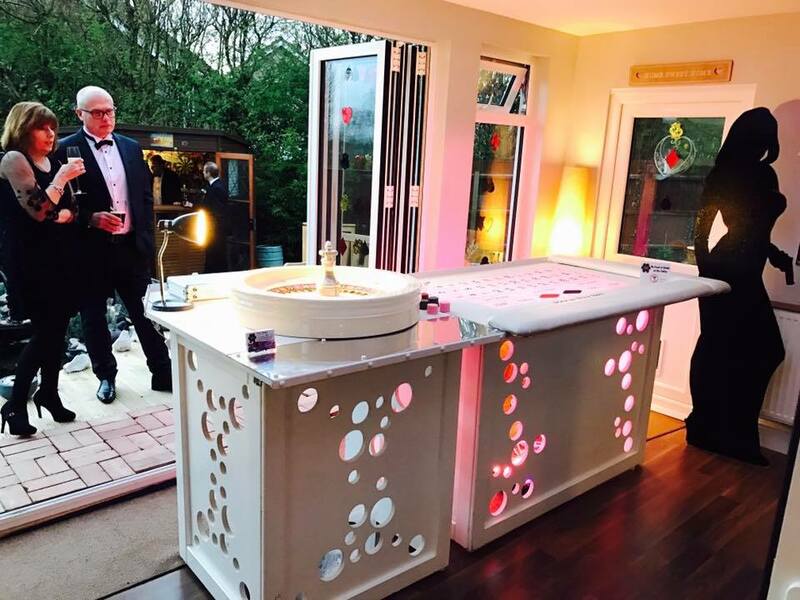 Or have multi-colour changing with fade options and even have the lights change to the beat of the music for the ultimate Disco Casino! For that little bit extra we use Professional Graphics Design Software to create personalised money notes with a picture of the birthday boy or girl and event details all displayed on our Playing Card note design. These are perfect as an invitation to your party and for your guests to exchange for casino chips on the night! Speak to us with your ideas and what you would like to include in your personalised money notes! With all of our Fun Casino Nights we complete a prize giving ceremony to award the biggest chips winners with a prize. 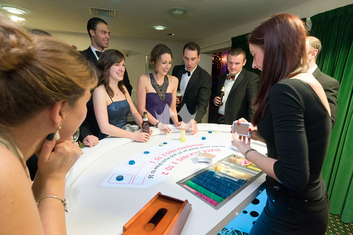 We can even organise a play-off between the top 5 chip winners to create an exciting finale to your event. 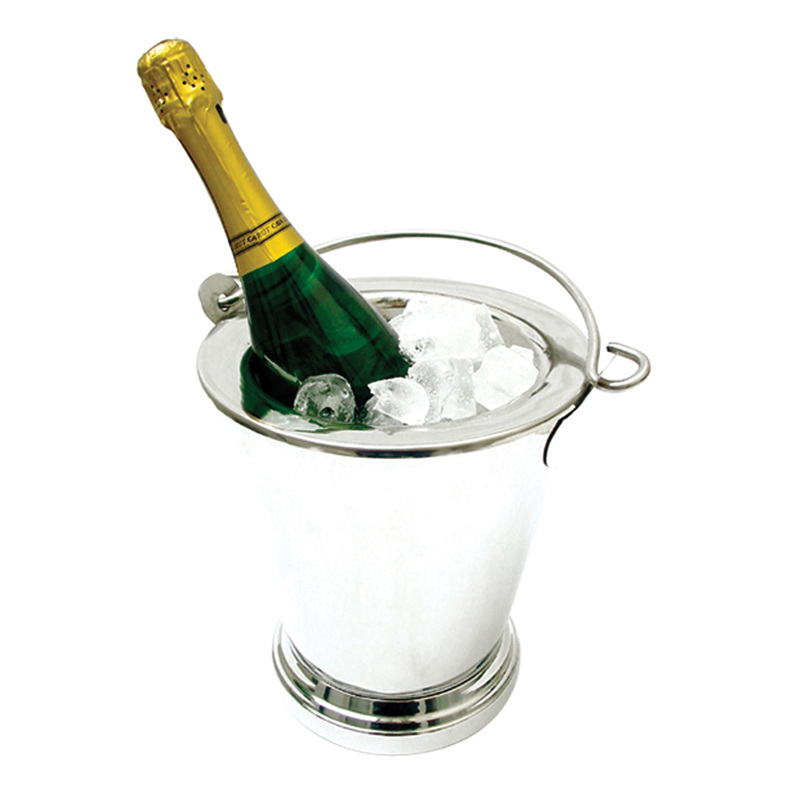 Cap off a great nights entertainment by awarding the winner with a bottle of champagne or a box of chocolates for example.